Putting your best foot forward and aiming to impress has always been one of the best ways to succeed, whether you’re positioning yourself or selling something (such as your house). Consider this: Have you ever heard stories of job seekers showing up to interviews wearing clothing far too casual, such as a tube top or shorts? In most cases, they won’t fit the image of what the prospective employer is looking for, and that judgment can cost them the job. The same can be said of your home when you’re trying to sell it! A potential buyer is going to judge your property the moment they set eyes on it, and if it doesn’t look and feel like a place they could call home, they aren’t going to place an offer. This is where professional home staging comes into play. It is a marketing technique that helps create an immediate emotional connection with buyers by drawing the eye to the home’s most attractive features, while minimizing its flaws. Most importantly, staging can help you sell your home faster – and for a higher price! On the flip side, buyer’s agents also say there is a noticeable difference when comparing staged homes to non staged homes. 77 percent of buyer’s agents agree that a staged home makes viewing a property easier to visualize for the potential buyer. Those buyers are also more eager to want to take a tour through a home after viewing it online, if they can see professionally staged photos of the listing. Most importantly: home staging can have a positive effect on the emotion of the buyer, generating more interest and simultaneously improving their ability to overlook other the property’s flaws! What are the most important rooms that create the greatest amount of impact? Realtors pinpointed three key rooms that most impact a buyer’s first impression: the living room, master bedroom, and kitchen. Not surprisingly, these rooms all happen to be the ones in which homeowners tend to spend the most time in. Getting a buyer to feel “at-home” when viewing your property not only helps make the difference between selling or not selling, it can also influence their offer. A home that looks to be of higher quality will attract better offers, and 44 percent of the realtors surveyed agreed that a staged home can help increase the offer by 1 to 10 percent. 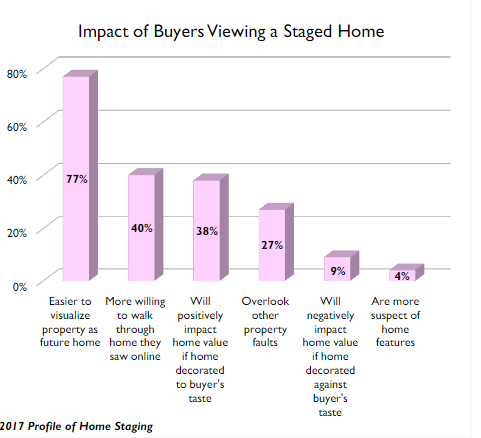 While these statistics all sound fantastic, there is one big caveat to successfully staging a home: Ensuring that the changes being made are ones that buyers in your area will appreciate! Real estate is a very local affair, and what works in one neighborhood or market may not necessarily be the best strategy for another. Home buyers in California are not going to have the exact same interests and needs as those in Missouri. Knowing your local market and what buyers in your area are looking for is a key strength of a Certified Staging Professional—you’re getting far more than de-cluttering advice and suggestions for updating fixtures and décor. Rather, you’ll get a complete , strategically designed game plan of how to present your home in a way that will appeal to the most buyers in your area. Much like snowflakes, no two homes are exactly alike—even in the same neighborhood—and what works for one home may not be the best approach for another. At Staging That Sells, we walk through your home and provide a thorough consultation to assess your home’s best selling points as well as its flaws, your ideal buyer, and the specific strategies necessary to give your living space the greatest amount of visual appeal. Whether your property is in St. Louis City, the metro east, St. Charles County, or anywhere in-between—you’ll get a professional assessment tailored to your specific home and neighborhood. Best of all, staging can be done whether your home is a vacant property or an occupied property. Staged homes do sell faster, and if you’re looking for a proven technique to gain on edge on other sellers in your area, consider arranging a consultation and seeing what staging can do for you.